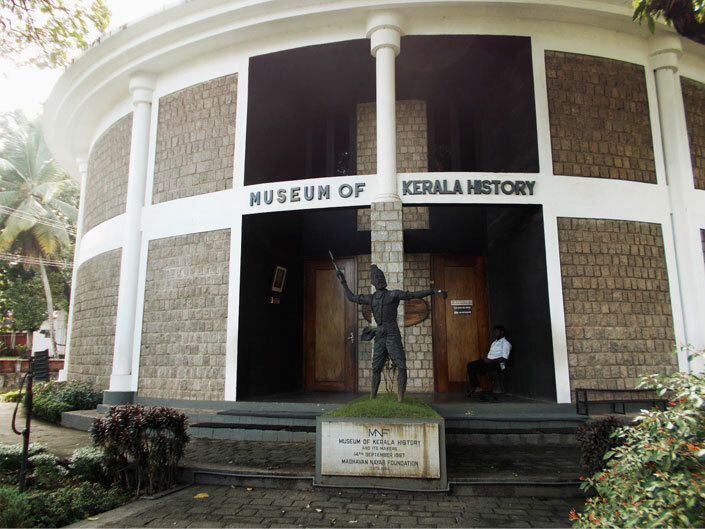 Kerala history museum is located in Kochi and is an interesting museum for those who like to know about the culture and tradition of our state. This museum is run by a charitable trust and is also called as the Madhavan Nayar Foundation. This museum was founded in 1987. The building is very beautiful and is made of granite in a round shape. On the entrance of this museum is the statue of Parasurama, incarnation of Lord Vishnu. This museum is different from the rest of the museums. As the name indicates, this museum insists on upholding the traditional culture and history of Kerala. A light and sound show which depicts the 2000 year old history of Kerala has been conducted by this museum and is quite famous. The history is displayed in 36 visuals. The one hour show describes the history of Kerala and also displays all the history makers of Kerala. There is the MNF gallery of paintings in which several famous paintings are kept for display. Some of the paintings include the works of artists such as Raja Ravi Varma, Mammiyoor Krishnan Kutty Nair and various other artists. There are varieties of objects that have historical or artistic value. Some statues of figures of Neolithic age are also kept here for display. It includes the statues of tribal ancestors who lived in forests. It is possible for one to understand the whole history of Kerala through these statues. Some of the famous personalities whose statues are kept here include that of Marthanda Varma, the Raja of Travancore, Vasco da Gama, Pazhassiraja, Thunchath ramanujan ezuthachan etc. Another main attraction is the statues of art forms such as Kalaripayattu especially that of Unniyarcha which is very beautiful.